The Norman ML400 is a self-contained 400 w/s flash unit. This is a B&H 2 monolight, 800 total watt/second kit. The ML400 accepts over 100 Norman accessories and light modifiers including softboxes, reflectors, grids, snoots and barn doors, using the included R9113 Adapter Ring. A digital readout displays accurate, repeatable settings up to 400 watt-seconds in 1/10 stop increments. 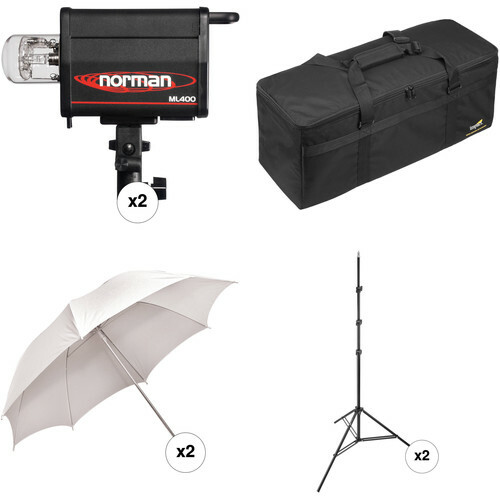 This Norman ML400 2 Light Kit includes umbrellas, light stands, and a kit case. The Norman ML400 Monolight is a self-contained 400 watt/second flash unit. The ML400 accepts over 100 Norman accessories and light modifiers including softboxes, reflectors, grids, snoots and barn doors, using the included R9113 Adapter Ring. A digital readout displays accurate, repeatable settings up to 400 watt/seconds in 1/10 stop increments. The controls on this 400 watt/second Monolight allow power adjustments in either watt-seconds or f/stops. Low noise, high performance fan offers increasaed protection during the most demanding applications. Box Dimensions (LxWxH) 16.2 x 11.5 x 10.8"